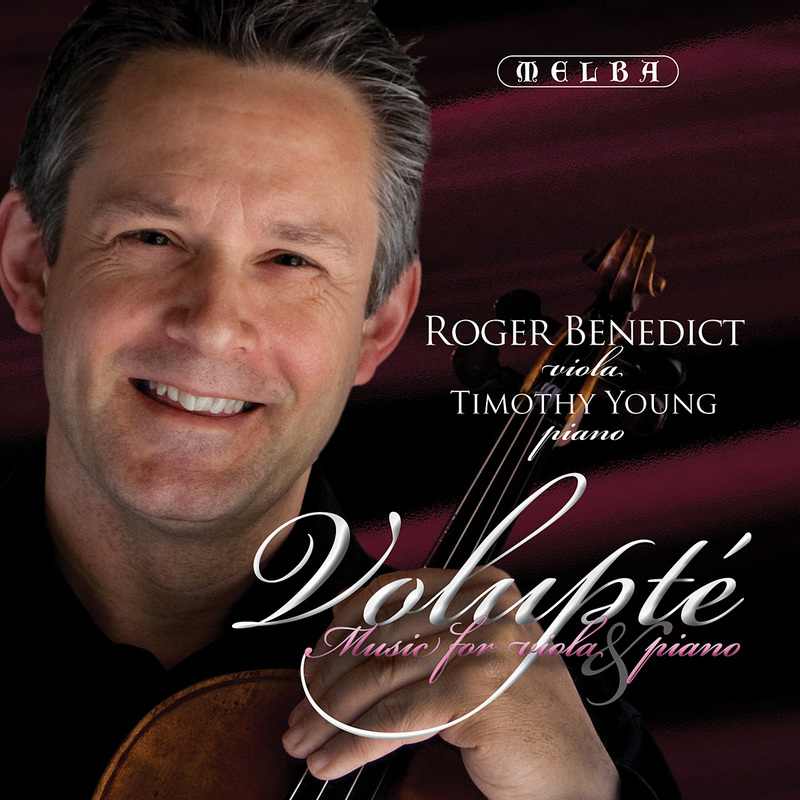 Music for Viola and Piano by Kœchlin & Jongen, played by outstanding musicians Roger Benedict, Timothy Young and guest artist Ben Jacks. Jongen and Kœchlin are two names that are not at the top of anyone’s list of most recognised composers of the twentieth century. In fact most music lovers will not have even heard their names let alone their music. But they are two individual and distinctive musical voices who followed their own path and composed some wonderful music. The viola music of Jongen has an unashamed focus on the melodic line, with the melodic line driving the drama (of his pieces) forward, projecting it headlong through episodes of rapture and exquisite beauty, often interspersed with passages of great bravura display and virtuosity. The harmonic colour of his music shows a love of the French impressionist palette but is always applied with his own brush. As a passionate Frenchman sympathetic to communist ideas Charles Kœchlin felt deeply the responsibility that he write music that was within the reach of everyman, at the same time offering pieces that were of uncompromised artistic merit and emotional truth. Kœchlin’s mighty viola sonata bleeds with the tragedy of war-time horror. It is unexpectedly gripping for a work written for the seemingly polite ensemble of viola and piano. His skill with textures, harmony and colour creates a piece of enormous emotional impact, from its initial numb desolation through cries of anguish then the desperate morse-code tap-tapping of its moto-perpetuo. Listening to this piece is a truly remarkable emotional journey. The wistful beauty of his petites pieces for Horn, Viola and Piano, show that the playful mood of pieces written in his youth can coexist with the exquisitely painful yearning for a time lost. Born six years apart and dying within three years of each other, the Belgian and French composers Joseph Jongen and Charles Kœchlin were almost exact contemporaries, but their chamber music inhabits distinctively different sound worlds. Whereas Kœchlin absorbed many influences and established a notable presence outside his own country, the younger but shorter lived Jongen’s life was much less eventful, his music, although of real quality, more introvert and not as forward-looking in its harmonic content. Despite acquiring a considerable reputation in his native Belgium, regrettably little of his output is now familiar outside his own country. Joseph Jongen was born in Liège on 14 December 1873 to an artistic family and immediately showed exceptional musical ability in composition and a ready facility for organ improvisation—talents his younger brother, Léon, would also readily demonstrate. Entering the local conservatory at the age of seven, he began serious composition at 13, won a prize with a precocious string quartet at the age of 21 and a Belgian Prix de Rome at the age of 24. He travelled widely in Europe, briefly coming under the influence of such diverse composers as Richard Wagner and Gabriel Fauré. During the First World War he lived in England where he formed and led a piano quartet; later, after the end of hostilities, he became a director of the Brussels Conservatoire and a conductor of Les Concerts Spirituels, public concerts of largely choral music based on religious subjects. But in spite of this exposure to other influences, he remained comparatively conservative in his own outlook. Jongen’s most famous orchestral work was the Symphonie Concertante for organ and orchestra (which has been recorded more than once). But the greater proportion of his output is of chamber and instrumental music. Those pieces included here have many of the characteristics of late Romanticism, especially a gentle lyricism and a cosmopolitan style with something in common with Saint-Saëns, the melodies often easy-going, but with harmonic elements drawn from Debussy and Ravel. Sadly, with the introduction of atonalism and other modern elements, with which he had no sympathy, towards the end of his life Jongen withdrew many of his pieces, insisting they were too traditional and thus had little value when compared with the newer and more dominant musical trends he heard around him. But the four works on this recording are splendidly written for the viola and piano, with a ready flow of ideas and coherent structures. Indeed, while each stands up excellently in its own right, one can readily play two or three of these pieces side-by-side to make a composite whole. The opportunity to listen to all four together is very satisfying. Written in 1925, the Op. 79 Allegro Appassionato (Track 12) is typically both classical and romantic in style and feeling. It surges off with firm dotted rhythms, but soon introduces a haunting veiled secondary episode, with a delicately individual, rather French harmonic feeling. A skittish scherzo finale then rounds off the piece, quoting from the opening material and bringing a firm finality. With its frequent mood changes, the later Concertino (Track 9), dating from 1940, begins gently but quickly expands energetically, immediately suggesting the work’s principal theme. The viola soon becomes more pensive, although the music’s vitality readily returns before letting up to introduce a characteristically winding sequential melisma for the viola, imbued with a touch of gentle melancholy. This acts as a contrasting slow section before leading into a light-hearted, carefree dance sequence. But there is again a period of reflection for the viola, before the jaunty dancing theme re-asserts itself, this time even more catchily, for the close. The Introduction et Danse, Op. 102 (Track 10) opens reflectively and not a little sombrely, before the viola begins to songfully explore another of Jongen’s haunting instrumental melismas. The mood lightens and a march-like tempo emerges, first doleful but noticeably growing in confidence as its momentum quickens to give a lively account of the dance. Composed in 1900, and heard here in a newly edited version published by the Belgian Documentation Centre for Contemporary Music, the touching Andante Espressivo (Track 11), which begins with an evocative solo piano, offers one of the most poignant of the composer’s lyrical ideas, which is fluently worked out in an enchanting dialogue between free-flowing viola and eloquently responsive piano. The background of the French composer Charles Kœchlin was quite different from that of his Belgian counterpart, and his life much more eventful and influential. He came from an affluent and philanthropic family who had made their fortune in textiles. Contracting tuberculosis while still a student, he began to take a serious interest in music during his convalescence. In 1909, with the co-operation of Fauré, Ravel and Florent Schmitt, he set up the Société musicale indépendante to promote new music, and, from 1918–37 made four lecturing visits to America. Underpinning his music life was his support of communism (although he never actually joined the party) throughout the 1930s, and his encouragement of musical populism ‘written for the people’. In spite of his twice winning composition prizes, most notably the Hollywood Bowl Prize for the symphonic poem La joie paienne in 1929, and being well connected—he knew Debussy, Poulenc, Milhaud, and later Messiaen and Boulez—all these activities tended to eclipse his own musical output. However, in the 1940s the then director of the Belgian Radio, Paul Collier, promoted a revival of Kœchlin’s music, and more recently the appearance of his orchestral music on disc has shown its remarkable command of atmosphere and sonority, and its luminous evocation and exotic feeling for orchestral colour. He wrote a large number of shorter but no less expressive orchestral works, and in his 1933 Seven Stars symphony paid tribute to cinema idols Clara Bow, Douglas Fairbanks, Greta Garbo, Marlene Dietrich and Charlie Chaplin, among others—a striking expression of the ‘musical populism’ he advocated. But what placed Kœchlin firmly in the repertoire was his series of works based on Rudyard Kipling’s Jungle Book stories, which occupied him for nearly half a century from 1900 onwards. They are highly individual, their eclecticism balanced by a free originality and sometimes disconcerting sudden changes of style and tempo. But undoubtedly he was at his finest in much of his chamber music and more of that is being discovered by an expanding number of recordings. Kœchlin greatly admired the music of Milhaud for its colour and wit. Kœchlin remembered Milhaud’s chamber music, easy-going and full of inconsequential charm, in his Quatre Petites Pièces (tracks 5-8)—miniatures separately composed over a period of a decade—and unexpectedly scored for horn, viola and piano. Gathered together in 1974, they are simple and memorably melodic, with horn and viola echoing each other in appealingly reciprocal dialogues. The opening Andante, the last of the four to be composed, in 1906, is movingly eloquent, the Très modéré, the earliest work, dating from 1896, very simple, almost like a folk theme, the Allegretto quasi andantino (also from 1906) agreeably light-hearted, while the infectious if surprisingly short final gallop of 1903, marked Scherzando, is the most catchy of the four. One of the difficulties with the lyrical pieces is that the horn (very much leading the ensemble) can tend at times to slightly over-balance its companions, but the writing (and playing here, with associate artist Ben Jacks on horn) is very well integrated. Begun in 1912, completed three years later, and dedicated to Darius Milhaud, the Sonata pour Piano et Alto, Op. 53 (Tracks 1-4) is a major work, one of Kœchlin’s finest. It is pensive, ruminative and introspective in character, with a memorable extended slow finale. The opening Adagio, which is compact and concise, has a dark eloquence and brings out the rich espressivo of the viola’s middle and lower register. This is heightened by an unusual scordatura effect where the lowest string is tuned down a tone to B flat. Then comes a bravura Scherzo, built over a moto perpetuo piano sequence, bursting with vitality, essentially buoyant and spirited. There is a contrasting, questing centrepiece, which rises up to a passionate climax before boldly returning to the opening material. The music then becomes more ethereal as it moves into the ruminative third movement (Andante), where the viola soars aloft in a serene soliloquy over piano chords that seem to anticipate the later manner of Messiaen. The ambitious and rhapsodic finale opens by echoing the mood of the first movement but soon becomes strong and passionate. It seems likely that Kœchlin intended this as a threnody for Milhaud, the loss of his close friend summoning up music that reveals a great depth of expressive feeling to bring his wistful tribute to an elegiac close. This recording is dedicated to the memory of Roger Benedict’s father, Leslie, who sadly passed away during the recording period.